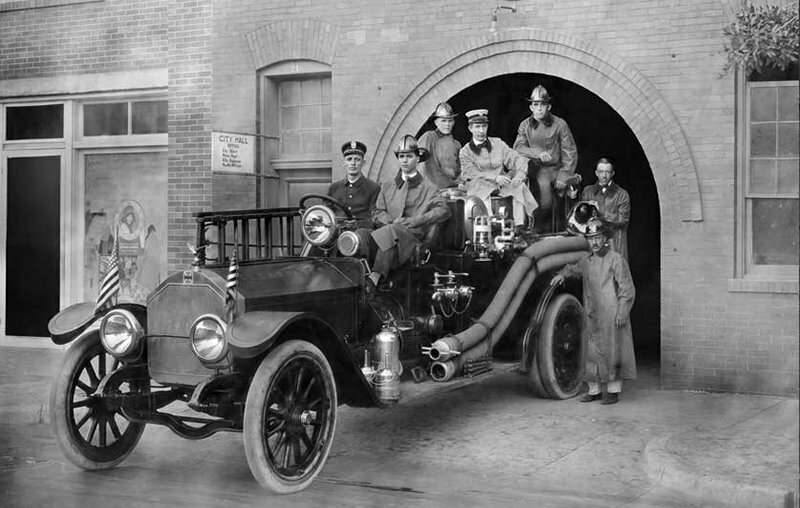 Clearwater’s City Hall and Fire Department housed top-of-the-line fire equipment when this photo was taken in 1915. Fire Chief Ora Hart is the gentleman in the white coat. He was paid $50 a year for his duties. The firefighters at that time were paid $7 per fire. This property is now owned by the Church of Scientology. Photo courtesy of State Archives of Florida, Florida Memory. The Peninsular Telephone Company was established in Clearwater in 1903. 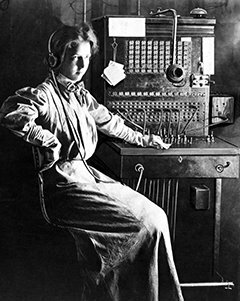 Here is Mrs. Hart, one of Clearwater’s first operators. The Telephone Exchange Building is still standing, at the northwest corner of Cleveland Street and Garden Ave.
By the turn of the 20th century, Clearwater was becoming a modern town. With the installation of a water main, electricity, a telephone exchange, an ice factory and a recreational pavilion at the end of a public dock, Clearwater was growing by leaps and bounds. Hindered by slow communication (where getting to Tampa, the closest governing body in the region, could take all day), leaders in the communities of the Pinellas Peninsula sought to make their own bid for independence. The City of Clearwater was officially incorporated in May of 1915. 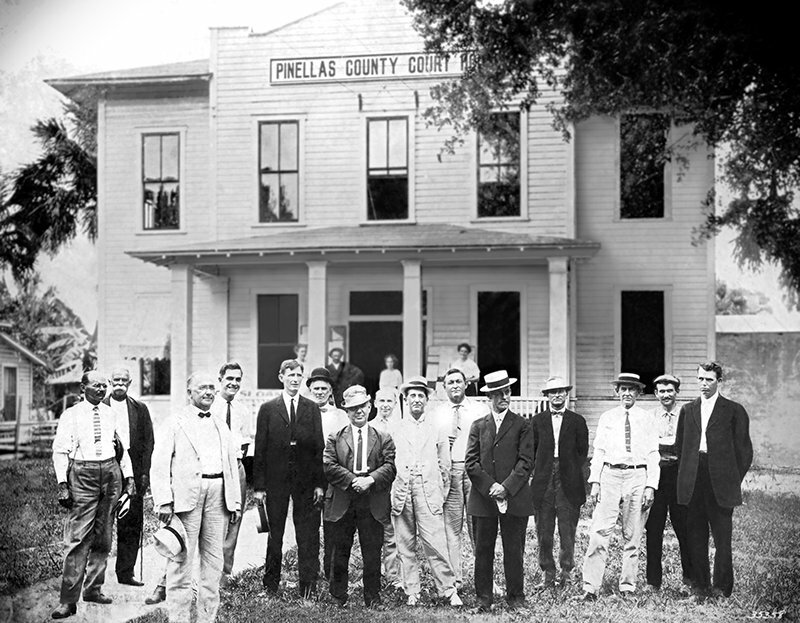 Pinellas County’s first courthouse was erected in January of 1912 on the site of the present-day Peace Memorial Church on South Fort Harrison. Its cost was $3,750. Among the first officers identified in the photo are from left to right: S.S. Coachman, county commissioner; Mr. Caruthers, a visitor; L.D. Vinson, county commissioner, Tarpon Springs; John N. Brown, tax collector (in black suit); Uncle Eli McMullen (in derby hat), county tax collector; F.A. Wood, county commissioner, St. Petersburg; George Rowland, attorney for the commissions (front with white suit). In the rear: O.T. Railsback, county commissioner (white shirt); C.W. Weicking, clerk of the court (black suit); Marvel M. Whitehurst, sheriff (black suit, white hat); Mr. McClung, Dunedin; George Merril, county supervisor; Dixie M. Hollins, county school superintendent. Quoted from Clearwater a Pictorial History, by Michael L. Sanders, published 1983 by Donning Company. Photo courtesy of State Archives of Florida, Florida Memory.